Even "buy-and-hold" investors can't afford to let their portfolios collect cobwebs. Valuations and fundamentals change perpetually, and shareholders need to know what they're holding -- and if there's more potential for growth elsewhere. Here we take a look at some stocks worth swapping. Everyone but Research In Motion (RIMM) seems to know that many of today's BlackBerry owners will be on Android or iPhones by the time their two-year service contracts run out. 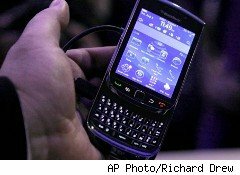 Shares of the BlackBerry grower were squeezed after posting disappointing quarterly results on Thursday night, and rightfully so. Revenue fell 10% to $4.2 billion, well short of the $4.5 billion that analysts were targeting. Adjusted earnings took an even bigger hit, falling all the way to $0.80 a share, again, short of both the $1.46 a share it posted a year ago and the $0.87 a share that Wall Street was expecting. RIM can point to a gain in service revenue. The Ontario-based smartphone pioneer can also brag about having 70 million BlackBerry users, 40% ahead of last year. However, if the new hardware isn't selling, it's time for investors to consider swapping their BlackBerrys for something better. Unlike RIM, Apple (AAPL) isn't having a problem selling handsets. It sold more than 20 million iPhones in its latest quarter -- 142% more than it did a year earlier and twice as many smartphones as RIM shipped during the period. RIM just doesn't have it. Remember when folks were calling RIM's PlayBook tablet an iPad killer? Well, after shipping 500,000 PlayBooks during the previous quarter's launch, RIM shipped just 200,000 of the devices this past quarter. It takes Apple just two days -- not three months -- to clear 200,000 iPads. RIM isn't dead, but it's bleeding slowly. Even as it eyes sequential -- though seasonally expected -- improvement in the current quarter, the company's relevance fades with every passing period. We live in a world where Google's (GOOG) Android continues to pad its market share lead in terms of new smartphones being sold, and Apple is no slouch on the high end. Microsoft (MSFT) is investing billions -- billions that RIM doesn't have -- in a deal to have Nokia (NOK) crank out smartphones with Microsoft's updated mobile operating system. RIM may have a beefy base of users now, but check again in a year or two. Value investors will argue that RIM is too cheap, but you can never be cheap enough if your business is in decline. Someone will buy out RIM? Who? Didn't we learn our lesson with the $1 billion Palm acquisition last year? If RIM users were a loyal lot, I'd be interested. But what does it tell you when just 1% of your 70 million BlackBerry subscribers -- and likely less than that -- have one of the 700,000 PlayBook tablets that have been shipped? Apple is the real deal, and it will continue to grow at a pace that is well above its attractive earnings multiple.Net sales soared 82% in its latest quarter, with earnings more than doubling. It's not bleeding. It's leading. Longtime Motley Fool contributor Rick Munarriz does not own shares in any of the stocks in this article. The Motley Fool owns shares of Google, Microsoft, Apple, and Research In Motion. Motley Fool newsletter services have recommended buying shares of Google, Microsoft, and Apple. Motley Fool newsletter services have recommended creating a bull call spread position in Microsoft and Apple.